Can a sword really be worth £10,000? Can a mandolin really be worth $225,000? 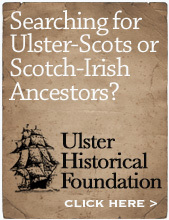 So when exactly was Ulster-Scots invented? The Day my Kids killed my camera? This 2008 book"In Search of Ulster-Scots Land: The Birth and Geotheological Imagings of a Transatlantic People, 1603-1703" looks very interesting, and much better than the author's previous one. 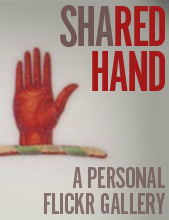 The new one is on GoogleBooks, and you can flick through it in the viewer window here. Yes, if it's the sword of the Covenanter hero Captain John Paton! You can visit the Lochgoin and Fenwick Covenanters Trust Museum here - they have some of Paton's other artefacts on display. Dr Ivan Herbison, Dr Frank Ferguson and I were recently interviewed for BBC Radio Ulster's "The Book Programme", presented by William Crawley. The bit we were in was produced and presented by Robbie Meredith, an oul freen o' mine. Here it is on the BBC iPlayer - click here. The relevant part starts at 19.30 in, about the recent Anthology of Ulster-Scots which was edited by Frank. It's an excellent collection, worth putting on your Christmas list if you're into books. Ever since my unexpected Talkback début earlier in the week, I have had numerous phone calls, emails and text messages from people supporting my comments in my original post about "Hunger" and the wider context. And not just hard-headed unionists. Quite a surprising number of professional people in the media and television industry (both broadcasters and independent production companies) have gone out of their way to phone me. I would like to thank them all for doing so. Meanwhile, courtesy of The Watchmen, I see that Gail Walker expressed similar views in the Belfast Telegraph about a month ago. ...if you drink Dr Pepper you're a Pepper too! That was the slogan of an old 1970s tv ad that I (and maybe you) grew up with, for the strange-tasting soft drink Dr Pepper. Well, in a publicity stunt a few months ago, the company said that if the 17-years-in-the-making-and-subsequent-music-industry-joke new Guns n' Roses album came out this year they would give everyone in America a free bottle of the stuff! So around 350 million bottles of Dr Pepper are potentially going to be offered free - available via a downloadable voucher on the company's website when the album is released. I say potentially, because the snag is that the offer will only be on the website for 24 hours. Never mind being free, you couldn't pay me enough to drink a bottle of Dr Pepper - it's mingin', honkin, or in Belfast-speak, ratten. As someone who spent many wasted teenage hours on my guitar trying to learn to play the intro to the Guns N Roses song "Sweet Child O' Mine", I hope the album's a lot better than the soft drink. Here's a pic of Graeme getting tuned up. We had a marvellous time here last Saturday night - we played for about an hour and a quarter in the most magnificent setting I've ever had the privilege of playing in. Sir James Hamilton, Founding Father of the Ulster-Scots buried below us, (and also in real life before our very eyes, greeting the audience as they came in!) in the church where the mighty Robert Blair had his Ulster ministry. There's a memorial to Blair's first wife, Beatrix Hamilton, in the vestibule (see pic below). For me the experience was literally spine-tingling - to play and sing and to read from Blair's biography in the very place where he preached is hard to explain. And the reaction from the people who were there, the Abbey's congregation, choir members, and the organisers of the event was marvellous. To be enthusiastically complimented on our two part "brother duet" harmonies by experienced, trained, choral singers is quite something for us! Buildings this old were designed to be acoustically perfect, and a single strum of the wee mandolin filled the place. I was very impressed that everyone going in was given a leaflet about Hamilton & Montgomery. It was a joy to be there, and thankfully they've asked us to go back. Next time we'll film the concert and put it up on YouTube! Nowadays the opponents, sceptics and critics of Ulster-Scots regularly allege that it's all false, and was invented in 1997 - and one of the callers to Talkback yesterday repeated this stereotype. However, the opponents, sceptics and critics of forty years ago were clearly very aware of the term. So when did this alleged invention take place? Few of these lemming-like critics will be convinced by the inconvenient truth that the term was first recorded in 1640, around the high point of Scotland's National Covenant and its impact on the Ulster Scots population. Click here for the full reference. So I unintentionally hit the big time today - a piece on Radio Ulster's Talkback on the blog post about "Hunger" and the general media trends that are out there at the moment. Just goes to show how widely read this wee personal blog actually is! The playwright Gary Mitchell was on Radio Ulster just last week talking about the same issues - partially covered here by the News Letter. "...a little volume which, after the Bible itself, did more for the spread of reformation doctrines than any other book published in Scotland..."
As the Reformation began to take hold in Scotland in the early 1500s, the area around Fife, St Andrews and Dundee became a hotbed of Reformation activity. Patrick Hamilton was burned at the stake in St Andrews in 1528, aged just 24, and his successor, George Wishart, suffered the same fate in the same town in 1546. The early Scottish Reformers in the area used what even today would be regarded as creative techniques to spread the gospel – street theatre and contemporary songs. In the History of Dundee, Robert Small (first published 1792) wrote of satirical plays and dramas being written and performed in Dundee in 1540 – in conjunction with Wishart’s preaching they had a huge impact on the local people. 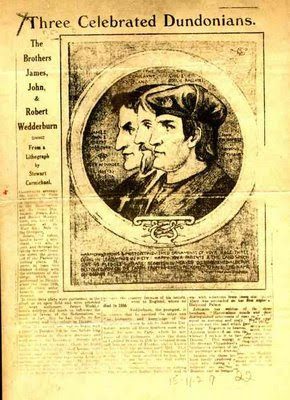 James Wedderburn was the oldest of the three; the middle brother John had to flee to Germany where he continued the work – there he “…changed many obscene songs and rhymes into hymns…” (Small, p 96). 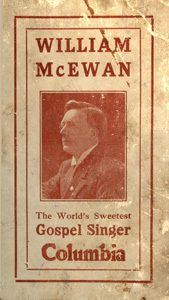 They “…turned the tunes and tenor of many profane ballads into godly songs and hymns, which were called the ‘Psalms of Dundee’, whereby he stirred up the affections of many…” (Small p 97). The youngest of the three, Robert Wedderburn, the Vicar of Dundee, ended up in Paris and joined with the leaders of the French Reformation. Robert had written a scorching document entitled "The Complaynt of Scotlande" (PDF link here), in which he stated that it was "...unpossible that Scottis men and Inglis men can remain in concord under ane monarchy or ane prince, because ther naturis and conditiouns are as indefferent as is the nature of scheip and wolvis....". Robert had had been fined in 1543 for destroying images in the local monasteries. When the troops of Henry VIII invaded Dundee in 1547, they burned Robert's house to the ground as they retreated, with the English officer, Sir Andrew Dudley, writing to his superior to plead that they must send to Dundee "a good preacher and good books, for they desire it much here, and I think it would do more good than fire and sword". The creativity and dedication of the three Wedderburn brothers was having a revolutionary effect in Scotland. The Wedderburn strategy wasn't to make the church worldly, rather it was the other way round - they seized hold of elements of the world's secular culture and turned them into powerful tools for Reformation and the gospel. Their approach has been analysed in an article by Anne Geddes Gilchrist entitled 'Sacred Parodies of Secular Folk Songs: A Study of the Gude and Godlie Ballates of the Wedderburn Brothers' (Journal of the English Folk Dance and Song Society, vol III no 3, 1938, pp 157-182). Here's a great quote, reinforcing the importance of the Gude and Godlie Ballates, from The Cambridge History of English and American Literature in 18 Volumes (1907–21). Volume III. Renascence and Reformation. "...It was about the year 1546 that there appeared a little volume which, after the Bible itself, did more for the spread of reformation doctrines than any other book published in Scotland. As no copy of this edition has been preserved, we can only conjecture its contents from the first edition of which we possess a specimen—that of 1567, apparently an enlarged edition of the original. The book generally known in Scotland as The Gude and Godlie Ballatis is, next to Knox’s Historie of the Reformatioun, the most memorable literary monument of the period in vernacular Scots..."
There appears to be a carefully co-ordinated revisioning of the Irish Republican movement going on. • A few weeks ago there was widespread public outrage at the BBC programme about the IRA escape from the Maze prison in 1983. • which coincided with the opening of a photographic exhibition about the decay of the Maze in what is left of the prison itself. One of the defining characteristics of the overwhelming majority (but of course not all) of Northern Ireland's unionist population has been its' ability to absorb and thole a generation of bloody terrorism - and not lash back, not vote for political parties aligned to terrorist groupings, not retaliate. To sit back and endure plays like "A Night in November" which demonise us, and which diminish our right to exist unless we become like "the other side". I just wonder when that same unionist population will finally crack, when will it have had more than it can bear, when will it finally stand up. Like the people of Chile eventually did when they finally realised the horrific price that "peace" had cost them when they let General Pinochet away with murder (he struck a sordid deal to allow the Chilean people a form of democracy - as long as they agreed to give him immunity from prosecution for the official figure of 3,197 murders he had presided over. He was later stripped of immunity and put on trial). Away from all the red carpets, the popping flash bulbs, the clinking glasses and the chic suits - here's a reminder from David Todd of what the hunger strike "heroes" were in prison for in the first place. So when does crime cease to be crime? When can murder become art? And when is it acceptable for a public body like Northern Ireland Screen to fund and publicise this type of revisionism and soft-focus arthouse propaganda - again and again and again. Dig through their website for yourself. And meanwhile the youth wing of Sinn Fein are painting Northern Ireland's standard "pillar box red" Royal Mail letterboxes green and get away with publicising their vandalism on the internet and radio, while the party itself is preparing to protest against the Royal Irish Regiment troops returning home from Iraq and Afghanistan. Even the IRA are suffering because of the credit crunch. Whilst Western news is dominated by financial meltdowns, foreign news is more interesting. The Japanese government are going to reveal plans in November to build what they're calling a "space elevator", which was first conceived by a Russian scientist in the 1960s. It'll be nearly 36,000 km high and will take a week to get from the surface of Earth to the top of the elevator, where there will be a platform of some type. However, what would it be used for? Seems strange to me, but is pretty close to Charlie's recent explanation of how to get to Heaven! I said, "Me, too! What denomination?" This bit of footage was rescued from the SD card on my now-deceased Kodak digital camera which sadly passed away in February 2008. I suspect that these were its dying moments - be careful where you leave your gadgets!